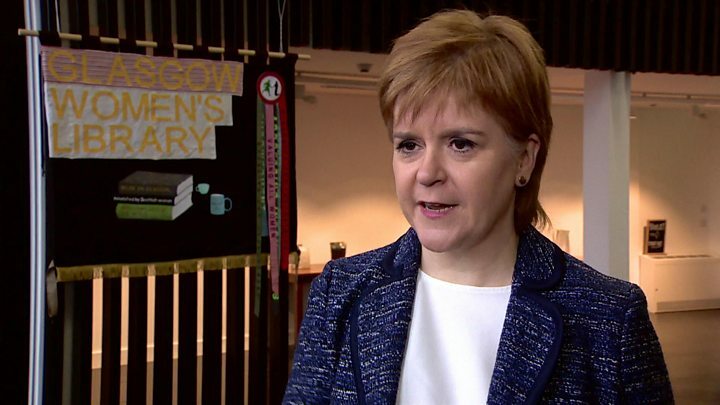 First Minister Nicola Sturgeon has announced a £500,000 fund to encourage more women to become involved in politics. The initiative is intended as a tribute to the suffragettes who campaigned for women to be allowed to vote. Backed by the Scottish government, the fund will provide grants for local initiatives across the country. A debate was also held at the Scottish Parliament celebrating 100 years of female suffrage. Women in politics - how much progress has been made? Speaking to BBC Scotland, the first minister said: "We've come a long way. There's no doubt about it. "In 1918, some women won the right to vote. It was 10 years after that before we had universal female suffrage. "The legacy of the suffragists and the suffragette movement is a really powerful one. As the first woman to be the first minister of Scotland, I know that I owe a huge debt of gratitude to the women who sacrificed so much back then to win our right to vote." The new fund will also back projects commemorating the 100th anniversary. Recipients will include the Glasgow Women's Library. In spite of what has been achieved, Ms Sturgeon said "much still needs to be done if we are to eradicate gender inequality and create a fairer and more prosperous country". But she insisted progress over the past century had been significant. "I often stand in Bute House, the official residence of the first minister, and I can look out the window over Charlotte Square," she said. "Charlotte Square was the starting point for the women's march from Edinburgh to London back in 1912. "I often stand there and look out and just imagine what they felt - solidarity and excitement no doubt, but also fear and trepidation." She added: "I sometimes wish I could just speak to them for a moment and say 'you will win, you will prevail'." Ms Sturgeon set the tone for a Holyrood debate later in the day by saying that the "uncomfortable truth is that gender equality is still an unwon cause", adding that "equal capability still isn't reflected in equal pay or equal status". Scottish Conservative leader Ruth Davidson also said that "we've come a long way in 100 years", before adding that "we are still not there, we've got a lot more to do if we want to see parity". Writing for the Daily Telegraph, Ms Davidson voiced her support for calls "to offer a posthumous pardon to those suffragettes charged with righting that wrong" - something Home Secretary Amber Rudd has called "complicated". Meanwhile, Scottish Labour leader Richard Leonard urged members to "harness the spirit of the suffragists and the suffragettes" in continuing the battle for gender equality. He said: "The scale of the struggle before us is huge. But the magnitude of our task should serve not as an excuse for inaction, but as a motivation for more action."